Home > Physical Development 3+ > How Active Should My Child Be? Physical development and activity is an important part of a child’s development. There’s a lot of emphasis these days about children being active, to help their future health and fitness levels, but as a parent, it’s often hard to know how active young children should be, especially if you have nothing to compare your child’s experience with. So here’s a useful guide for parents regarding how active under 5's should typically be. On average, children aged under five are typically full of energy. Given the opportunity, many of them would be on the go and enjoying lots of active play throughout the day. Having so much energy is natural for children and should, where possible, be encouraged. Although children need lots of different types of activity and play in their life, physical play and physical exercise remain an important element of this. 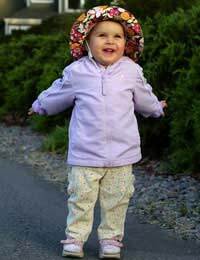 By the time they’re two years old, most toddlers should have the ability to walk and run easily, plus they should be able to jump on the spot using both their feet. By the time they’re three years old, these physical skills should have developed further and made them more proficient at walking and running, in particular. They should now also have gained the ability to balance on one foot, ride a tricycle, kick a football and climb onto a playground climbing frame. Health recommendations suggest that all under 5's should have at least an hour of physical exercise incorporated into each day, plus eat a healthy, balanced diet too. Physical activity can take the form of both structured and unstructured activities. There are plenty of ways in which children can get their daily quota of activity, and gain more on top. Toddlers and crawlers can be encouraged to take an interest in basic physical activity by using age-appropriate toys, such as the safer style of baby walker, push and pull along toys and small sit on toys that move through when they pull themselves along on it. There are a wide range of classes and activity sessions that are suitable for pre-schoolers to attend, from toddlers to five year olds. Pick a class that you think your child will be interested in, be it toddler movement and music, a dance class, a gymnastics sessions or baby gym. Attend regularly and make the most of the opportunity for your child to be taught activities and skills that will aid their physical development. Another important way in which you can encourage your child to be active and help them develop a lifelong interest in activity is to do activities together as a family. If you all enjoy swimming, you could factor in a regular trip to the swimming pool, you could play football or Frisbee together in the park or you could take a weekly weekend walk to the shops together. Whatever activity you choose to do as a family, remember to enjoy it, make it interesting and exciting for your child and focus on it being fun, rather than a chore.